Summary: Isolated sulfite oxidase deficiency is a rare autosomal inherited disorder of the normal degradation of sulfur-containing amino acids. Premature death in infancy secondary to severe neurologic deterioration is the usual outcome. This article provides an analysis, in temporal form, of brain imaging findings in this disorder. Isolated sulfite oxidase deficiency (ISOD) is a rare autosomal inherited disorder of the newborn that leads to premature death (1). A few case reports of this disorder have demonstrated CT and MR evidence of cystic white matter changes and density differences in the basal ganglia (2–5). However, to our knowledge, this is the first report to show the temporal development of these brain abnormalities. In the absence of neonatal asphyxia, MR findings showing the rapid development of severe white matter cavitary changes may suggest ISOD, and they should prompt appropriate biochemical evaluation. A female full-term neonate had generalized seizure activity shortly after birth. Electroencephalographic recordings demonstrated diffuse, bilateral, hemispheric epileptiform discharges, which were eventually controlled with phenobarbital. The infant had small ears with overfolded helices, and short palpebral fissures. Lens ectopia, described in other reported cases of this disorder (3, 4), was not present. Initial MR imaging findings obtained when the patient was aged 5 days suggested an abnormal, possibly ischemic, pattern (Fig 1). Urine analysis revealed increased levels of sulfite. Further chromatographic urine sampling revealed increased cystine and methionine urinary levels. The urinary level of S-sulfocysteine was in the expected range for homozygotes with sulfite oxidase deficiency. Plasma levels of cystine were decreased, but no increased or decreased xanthine levels were detected; these findings ruled out a defect in molybdenum cofactor and confirmed ISOD. A diet low in protein, especially sulfur-containing amino acids (methionine and cysteine), was started. Follow-up MR images obtained when the patient was aged 12 days demonstrated signal intensity abnormalities in the midbrain, thalamic, and basal ganglia, and diffuse white matter changes as well (Fig 2). MR imaging performed when the patient was aged 31 days revealed dramatic changes, with large cysts within the periventricular white matter, as well as cortical, brainstem, thalamic, and basal ganglial signal intensity abnormalities (Fig 3). The infant, at 3 months of age, had severe neurologic retardation, with poor feeding reflexes. Axial MR image (TR/TE, 10,002/142) obtained when the patient was aged 5 days shows extensive areas of abnormal signal intensity, which suggest edema involving the bilateral cerebral white matter and bilateral parietal and occipital gray matter. The bilateral frontal and temporal cortex, as well as parts of the basal ganglia, are probably spared. Ventricular size is normal. Axial MR image (10,002/142) obtained when the patient was aged 12 days demonstrates ventricular size and sulcal prominence have increased since the study performed 1 week earlier. 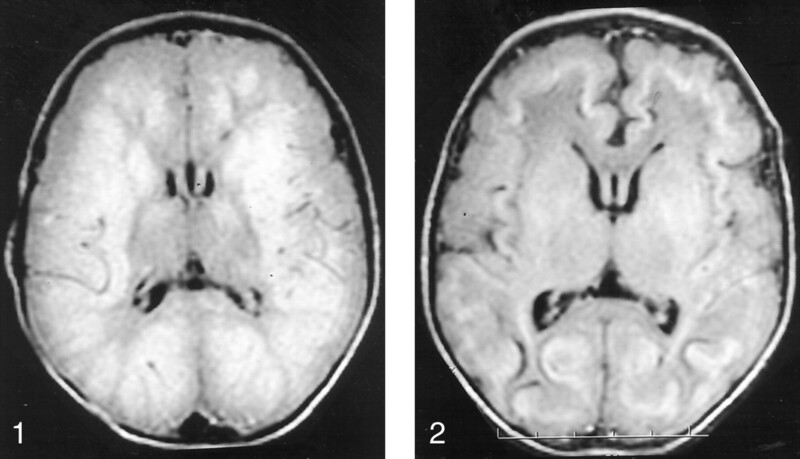 New curvilinear area of decreased signal intensity at the gray matter–white matter junction is present; it suggests hemorrhagic deposits and laminar necrosis. Axial MR images obtained when the patient was aged 31 days demonstrate dramatic changes compared with findings on initial images. Extensive new cystic cavities are within the bilateral parietal, frontal, and temporal lobes and are medial to the insular cortex in both hemispheres. While global thinning of the cerebral cortex is present, this atrophy is most marked in the subinsular and parietal regions. Abnormal signal intensity is present within the bilateral basal ganglia, including the caudate, globus pallidus, and putamen, internal capsules, and centrum semiovale. Enlargement of ventricles and sulci is consistent with neuronal loss. Sulfite oxidase catalyses the terminal reaction in the degradation of sulfur-containing amino acids, in which sulfite is oxidized to sulfate by means of a molybdenum cofactor and sulfite oxidase (1). Lack of sulfite oxidase, a condition caused by a rare inherited autosomal recessive disorder, leads to neurologic deterioration and early death (1, 2). A point mutation that results in a truncated protein that is missing the molybdenum-binding site has been identified in ISOD (1, 2). Rupar et al (2), on the basis of their neuropathologic findings of cortical necrosis and extensive cavitating leukoencephalopathy (reminiscent of that in severe perinatal asphyxia), suggested that energy deficiency is a cause of the structural changes. Patients with ISOD have seizures and progressive neurologic deterioration, which usually start at birth (3). Refusal to feed, with vomiting; ataxia in older infants; and chorea and progressive cerebral palsy also are seen (1). The clinical presentation of molybdenum cofactor deficiency, with or without sulfite oxidase deficiency, may mimic those of ISOD and Leigh syndrome (5–6). However, the former may have a longer survival pattern (7). The diagnosis is made when increased urinary excretion of sulfite and S-sulphocysteine is detected with low plasma cystine levels, although one case report had negative sulfite test results (4, 8). Decreased sulfite oxidase activity may be present in cultured patient fibroblasts, as well as in specimens from the brain, liver, or kidney. Prenatal sampling of chorionic villi may be performed in families with this rare disorder (1). The gross neuropathologic findings in brains of deceased patients with ISOD show severe atrophy of gyri, with cavitation of the centrum semiovale and increased ex vacuo ventricular enlargement (1, 2). Microscopically, cortical lamination at the gyral apices is well preserved, but in the sulci, one sees gliosis and marked neuronal loss. Loss of white matter myelination is seen. The dentate nucleus and basal ganglia show marked loss of neurons (1, 2). Limited reports (2–5) of CT and MR findings in ISOD describe cavitary white matter changes that are similar but less striking than the findings in this report. Molybdenum cofactor disease may cause cavitary findings in the white matter that are much less striking that those of ISOD (7). A related entity, cytochrome oxidase deficiency, does cause some signal intensity changes in the basal ganglia, with mild white matter atrophy, but it does not have the severe cystic changes in ISOD (9). Other entities, such as the mucopolysaccharidoses and lipidoses, may result in cystic white matter changes (10), but again, these findings are much less severe than those in our case report. 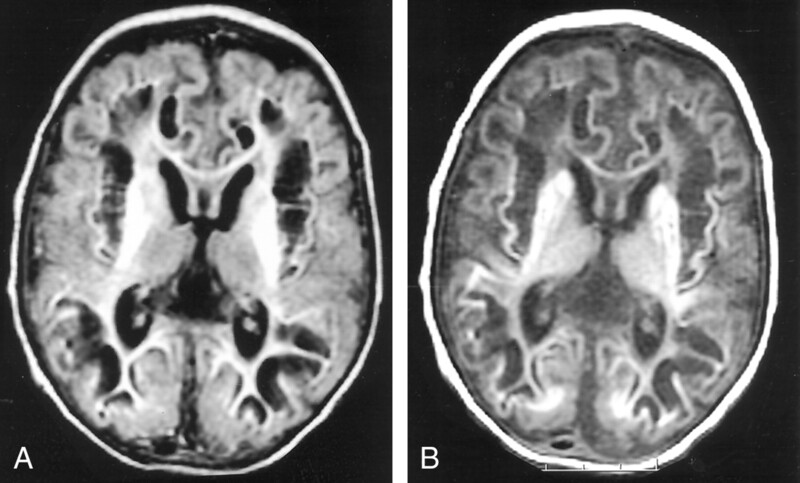 The findings in the present case indicate that MR imaging may reveal rapid progression of brain destruction in ISOD. In the absence of neonatal asphyxia, ISOD should be considered and pursued with further and appropriate biochemical testing. Accepted after revision August 16, 2001.